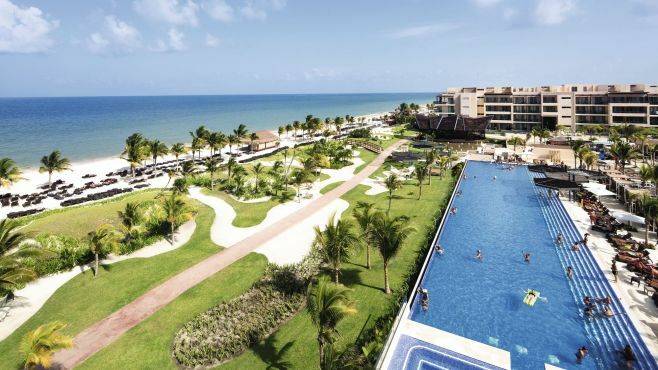 From the lake-like main pool, with its four water slides, to the quieter relaxation pools, you’ll love taking a dip at this beachfront hotel. Dinnertime’s a real treat, too, with Turkish, Asian and Italian cuisine forming a tasty trio of à la carte restaurants. 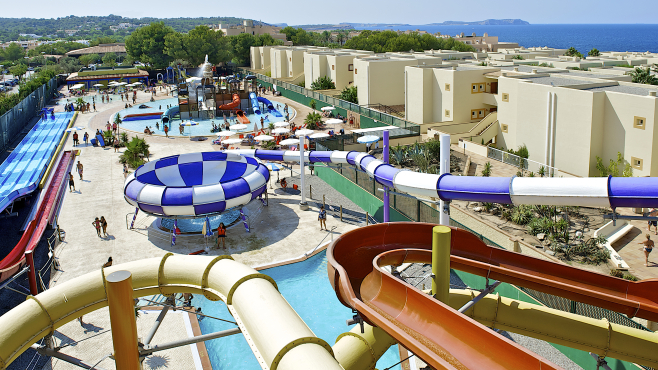 And, as you’d expect from our Holiday Villages, there are action-packed kids’ clubs and plenty of sports facilities for little ones to get involved with – even more reason for parents to relax. 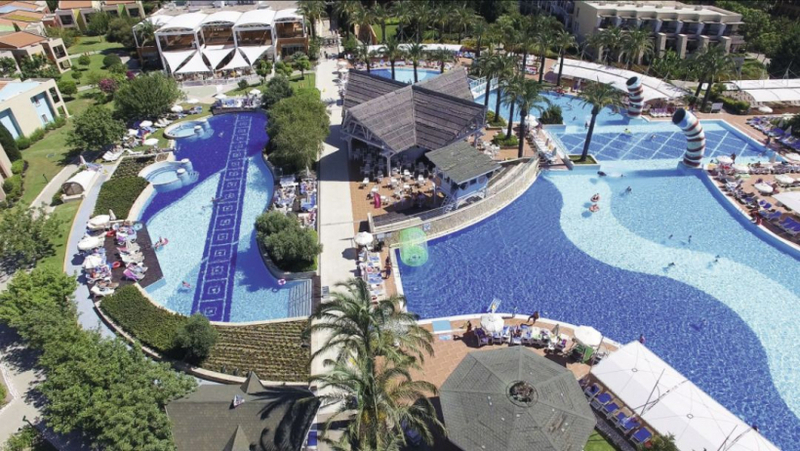 Top marks are awarded for the pools at this hotel – and rightly so, as it’s part of our SplashWorld crew. 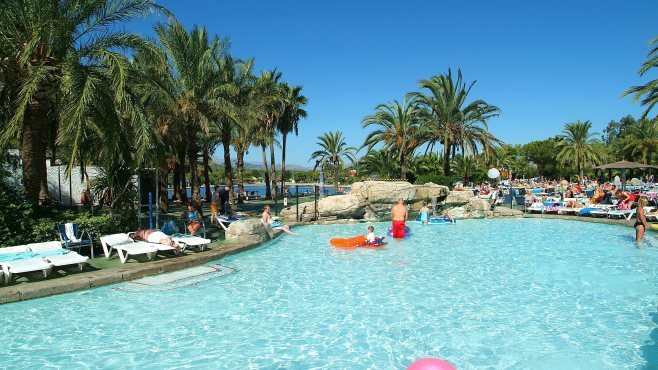 That means there are tonnes of splash-ready water slides at your disposal, and for no extra charge. Outside, you’ll find the hotel’s duo of swimming pools alongside and its crowning glory – the waterpark. Thrill seekers will love the Black Hole tube, tornado slide and 12-metre-high kamikaze, while the whole family can get competitive on the multi-lane slide. And, for the days you want your little ones to stay on dry land, All Inclusive activities like face painting are on offer in the kids’ club. 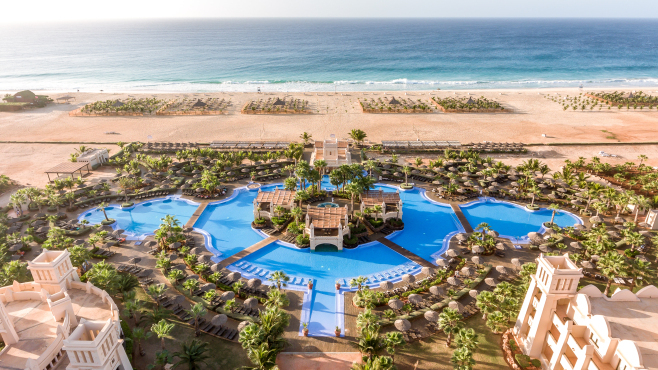 Scan your eye down TripAdvisor and you’ll see why this hotel in Cape Verde’s made our list. The hotel has an adults-only section, so couples can enjoy peace and quiet, while kids can be as loud as they want – everybody’s happy. And, when it comes to making a splash, there are six pools, including one that’s got a swim-up bar. Plus, you can claim a free scuba diving session during your stay. Local grub’s the name of the game in the Cape Verdean restaurant, plus, and there’s an Asian-themed restaurant, Kabuki, too. Plus, you can treat yourself to a spa day at this hotel. 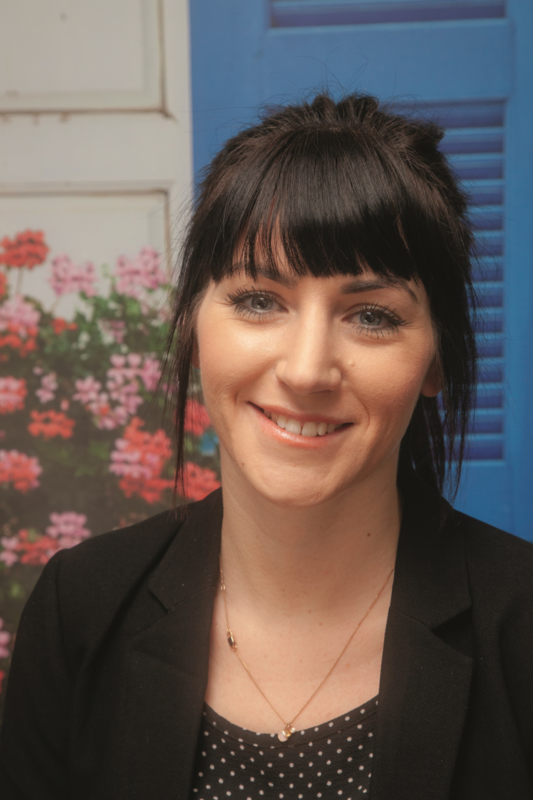 We’re talking top-to-toe treatments like aromatherapy massages, body wraps and mani-pedis. Who says Ibiza has to be loud? 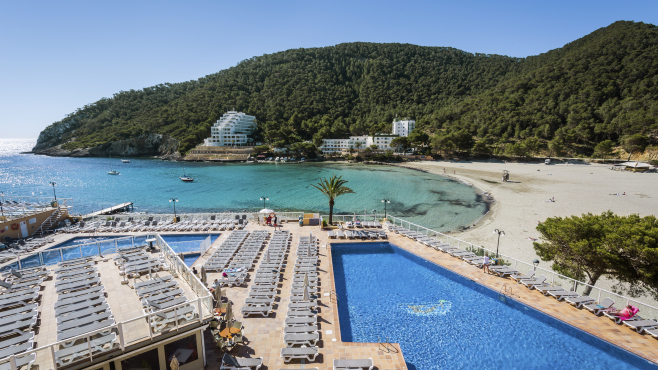 This hotel proves it doesn’t – it’s set in a peaceful bay overlooking the sea – perfect for getting some R&R. Sitting pretty in the hillside, you’ll get show-stealing views over the white-sand beach and pine forests, too. There’s a pair of buffet restaurants, which go big on international dishes, including favourite plates from home. The duos don’t stop there, either. The hotel’s two pools have plenty of loungers, plus the entertainment team put on poolside games, like water polo. They say three’s the magic number, right? Well, at Hotel Saturno, that’s definitely the case. It’s part of a three-hotel complex, meaning you get triple the number of pools and facilities to enjoy. Expect eight pools, a kids’ club, and a trio of buffet restaurants to chow down in. Plus, as it’s a SplashWorld hotel, you’ll get free entry to the waterpark just across the road – hello six-lane racer slide and a swirling corkscrew flume. This hotel’s got us wrapped around its little finger. For starters, all the rooms are suites and come with DreamBed mattresses and your own indoor whirlpool bath – fancy. 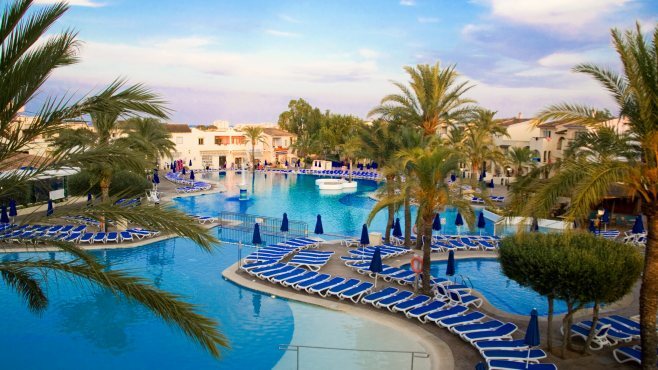 It’s a bit of a numbers game here – think seven pools, eight restaurants and 12 bars, including a swish martini bar. Feeling energetic? You can get stuck into activities like kayaking, tennis and snorkelling at this hotel, too. And after a hard day of holidaying, you can catch up with events in the sports bar, or head to the nightclub to strut your stuff. Sold on an All Inclusive break? See our deals to get the best for less. Plus, read about our top All Inclusive long-haul destinations and how to pack your suitcase in 12 easy steps. Make sure you keep up to date on our latest travel tips on our First Choice Inspire homepage.